One ringleader of the 1862 Ozaukee County Riot was Nicholas Kemp, an immigrant from Luxemburg, Germany, and blacksmith by trade, who had emigrated to America in 1846. At the time of the riot he was in the general mercantile business. In the days following the riot brought on by the fear of the draft drum, Governor Salomon dispatched troops who surrounded the town and took the rioters into custody. 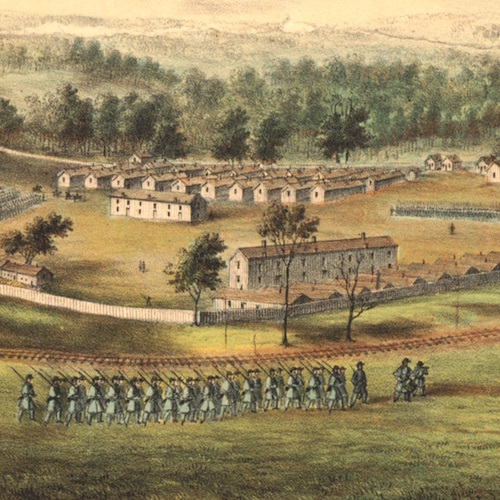 Anecdotal reports say that at first, Kemp boasted that there “were not enough soldiers in the state to take him” but when he was taken into custody, he was “as tame as a chicken.” Kemp and a number of others were imprisoned in Camp Randall located in Madison, Wisconsin where the ringleaders were held for months. Camp Randall, 1838. Image courtesy of Wisconsin Historical Society, Image ID: 1838. Abraham Lincoln. Image courtesy of Library of Congress Prints and Photographs Division. The Court, however, stopped short of actually freeing Kemp, not wanting to clash with the federal government. Interestingly, the Wisconsin legislature was deeply troubled by the court’s decision and notes from the Assembly in 1863 indicate some legislators hoped to pass a resolution rejecting the Supreme Court’s decision, but ultimately realized the Supreme Court needed to decide the matter. Fearing the precedent the case would set President Lincoln was apparently concerned about the outcome but decided to appeal to the U.S. Supreme Court. Before the case could begin, however, Congress moved forward and approved Lincoln’s suspension of habeas corpus, thereby legalizing the imprisonment of dissenters without trial. After his release Kemp returned to Port Washington where he became a business partner of William Ramsey, the officer who led the troops to Port Washington during the riot.